Ten June: It's Game Day, Baby! I'm a little bit in love with college football. And this Saturday is the first home game for the University of Georgia. It's Saturday in Athens, baby. Time to gear up in red and black, ride into my favorite college town and line up between the hedges to cheer the Dawgs on. Keep up with my game day antics and all things Bulldogs over on Twitter. You southern belles have it goin' on! And, that ring is so fun. I said it's great to be a GEORGIA BULLDOG. 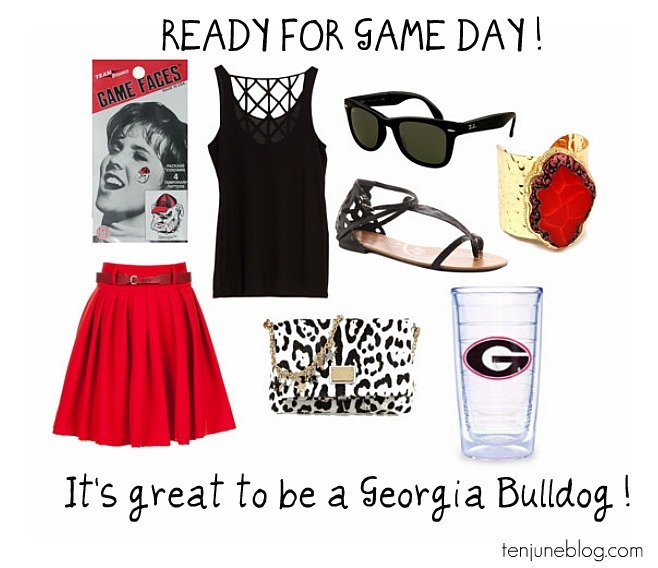 :) It is saturday in Sanford Stadium! Woo Hoo! I hate that I won't be in athens tomorrow, but cheer them on for me!! Go Dawgs! Just when I thought we could be friends...I am a Florida Gator:) I am also so excited about football season. It makes the pains of fall (cooler, wet weather and getting dark early) a little less bad. Go Liberty Flames - breaking out the Red/White and Navy Blue!!! My oldest niece goes to Notre Dame so we'll be cheering on the Irish as they battle Michigan later today!!! I love football season too. That is a darling outfit compilation! I would wear that anytime. oh my gosh that skirt and that bag - amazing! I was there at the GA game- so sad but still so much fun! I love gamedays in the South! !